Wide open spaces are no longer an agricultural necessity. While the rolling prairies with their endless acres of corn and soy have served American farmers well for generations, there’s a new kind of farming taking hold that promises to change the shape of how we grow. 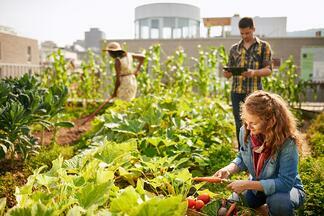 Urban farming, as the name suggests, refers to the practice of cultivating crops in densely populated areas. While it may sound contradictory at first, urban farming is an increasingly popular—and readily accessible—model for small commercial growers seeking to bring their produce to the very doorstep of consumers. Urban farming happens in forgotten or underutilized spaces: on rooftops, for example, as well as on vacant lots. Urban farming can happen indoors in vertical gardens, it can be done using self-contained kits that deliver maximum yield on minimum space, or it can happen in recycled shipping containers, which can be purchased pre-outfitted with a variety of grow technologies. Urban farming can be an eco-friendly alternative to traditional agriculture, delivering high yields on less land while consuming fewer resources. It’s less water intensive, less nutrient dependent. Growing urban means you can be closer to the consumers, which helps satisfy the increasing desire for locally grown products. There’s a potential social benefit, as well. Urban growing can help address the phenomenon of food deserts, city spaces where local residents have no ready access to fresh produce and other staples. By growing where the people live, urban farmers help close this gap. “Urban agriculture contributes to local economic development, poverty alleviation, the social inclusion of the urban poor and women, as well as to the greening of the city and the productive reuse of urban wastes,” one study found. Vertical farming can be done indoors, with technological aids used to control key environmental factors. By growing up and literally creating acreage in a series of stacked platforms, farmers can maximize yield. Hydroponics and LED lighting help plants to thrive, while sensors and monitors for moisture, nutrients, light, and temperature all combine to make a tiered planting system a powerful option for those looking to grow in urban spaces. Shipping containers offer another strategic means to grow in the city, where outdoor space may be limited or unavailable. At 40 by 8 by 9.5 feet, a standard shipping container offers ample room for a modest commercial enterprise, with the possibility of expansion built in: When it’s time to scale up, simply add another container. As an indoor operation, container farming relies on a range of technological controls. App-based systems can be integrated into the container to deliver irrigation and nutrients on a set schedule, giving the farmer the ability to remotely control environmental conditions. Mini farms or farm kits offer another easy way for a farmer to implement or expand upon an urban grow. Available in various sizes, farm kits typically have a small footprint and self-contained technological controls for environmental management. Whatever form they may adopt, most urban farmers rely on some version of controlled-environment agriculture, or CEA, technology. The term applies broadly to the sensors, remote controls, and app-based interfaces that enable agriculture in what might be considered challenged or constrained environments. In this sense, technology is, in fact, a key enabler of urban farming: Without the digital supports available through CEA and related systems, a farmer would be hard pressed to support a robust harvest in an urban environment. Powered by technology, urban farming is bringing agriculture closer to the consumer, reducing the carbon footprint of the farm while simultaneously satisfying the rising call for locally grown goods.